I made a few batts on my new drum carder from wool that I had previously dyed. 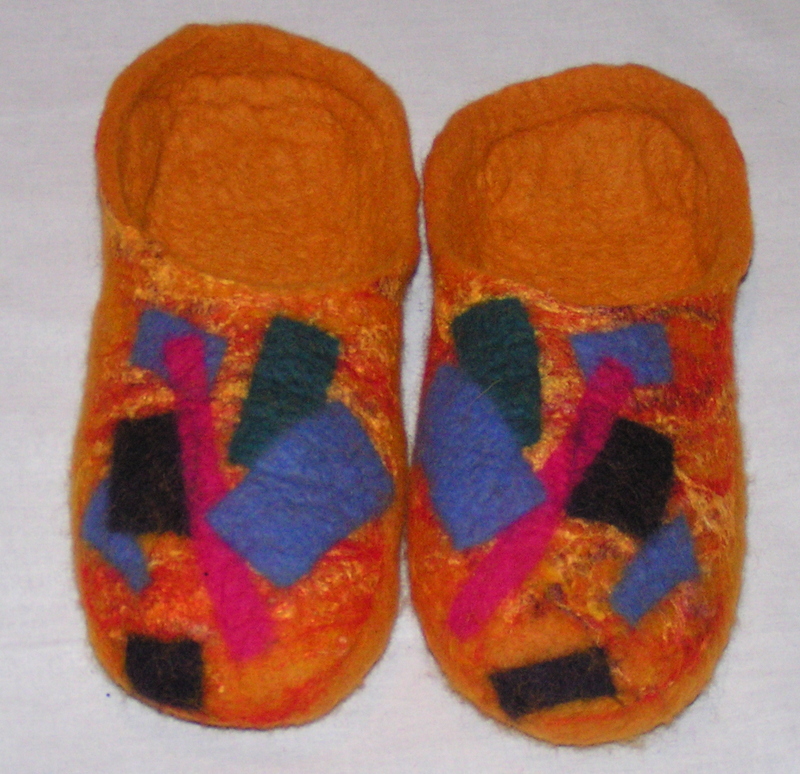 Two of the batts were just plain wool (mixed 56’s) and the third batt was several different shades of wool and a few different colors of silk noil for the tops of the slippers. That gave me a nice mottled background and I then added different sized rectangles of pre felt to give the look that many of Hans Hoffman’s paintings include. When I’ve made slippers in the past, I always used one resist for both slippers and then the slippers have a cuff. I wanted this pair to be more like clogs. So I used two separate resists and then cut out the opening on top. The last pair of slippers I made was too small for me as they somehow shrunk more than expected. These fit like a charm and even though my last pair of slippers was grey, I love the bright colors. I enjoyed learning a bit more about Hans Hoffman and I certainly wouldn’t have come up with this design on my own as it isn’t really my style. Challenges are always fun and push you to try things that are new. Have you tried anything out of your comfort zone lately? 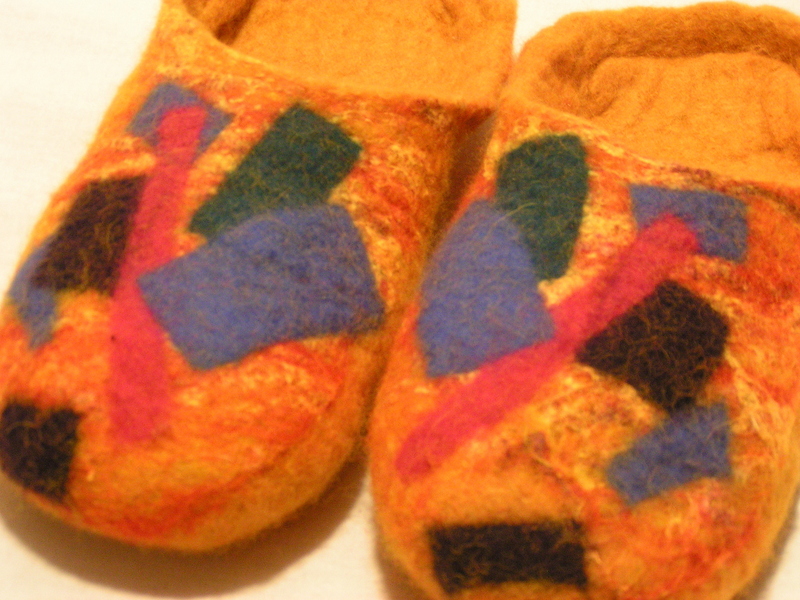 This entry was posted in Challenges, Wet Felting and tagged felted slippers, Hans Hoffman, wet felting. Bookmark the permalink. Very cool! And well-done, too! Thank you for sharing! These are really nice Ruth, I prefer the clog style for slippers too. You really got the pattern to match well on them both. That’s a nice painting, too. Great job Ruth. It sounds like a great group to belong to. Thanks everyone! I love attending our group meetings. I always learn something new and I love to see what everyone else comes up with when we do challenges. Thanks Karen! The only reason I have a local group is because I started it. You just have to look around for other people interested in the arts and start a group. They don’t all have to be interested in felting, you can learn lots of stuff from people in other areas of art. Really can see the Hans Hoffman influence – you did a good job on that – and they look so snuggly.